You should already be tracking your company’s innovation efforts using metrics such as return on failure or the growth gap. However, it’s just as important to look beyond your organisation to ensure you’re not spinning your wheels while others are streaking miles ahead of you. An innovation industry benchmark tells you how your company compares with your peers, uncovers what further work needs to be done, and can provide positive PR fodder should you be #winning at innovation. Here are 10 questions to answer when reviewing your innovation performance. Want to know how you compare among other organisations within your industry? 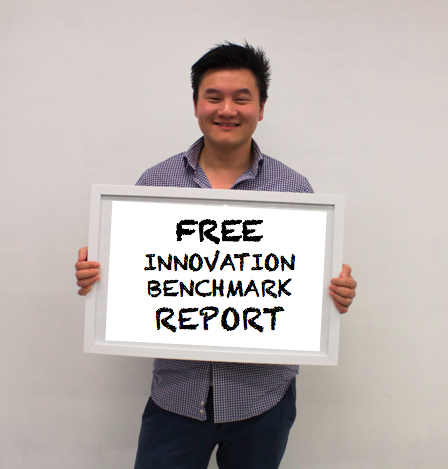 Get your FREE Innovation Benchmarking Report now. Q1. How open are employees to using external and internal ideas, as well as collaborating with outside experts and organisations? As firms seek to drive innovation within their organisations and industry, many are leveraging the benefits of open innovation to boost their success rate. ‘Open innovation’ (OI) was coined by Professor Harry Chesbrough in his book of the same name. OI is about collaborating with industry experts, budding startups and customers to take advantage of emerging technologies or advance existing products and services. Q2. Does your organisation have a transparent and clear method for improving the customer experience? A clear process for implementing customer feedback sends an important signal to external customers, as well as employees, that the organisation takes incremental innovation (continuous improvement) seriously, while leaving the door open for disruptive innovations. Organisations that lead the way in customer experience remain ‘sticky’ in customers’ minds and conversations, and are more likely to thrive in this era of rapid disruption. These 4 companies leading the way in customer experience undoubtedly hold innovation at their core. Q3. Does your organisation participate in corporate accelerators or venturing which allows the integration of new technology or ideas developed outside, into your organisation? Businesses that partake in corporate venturing by investing in external projects and startups are at the bleeding edge of innovation. By keeping one eye on the mothership while scouting the environment, these organisations are able to detect emerging threats and integrate potential tools for disruption to stay ahead of the competition. Read 4 Ways to Win at Open Innovationfor more ideas on how your organisation can stay competitive. Q4. How much autonomy do employees have in their roles to to conduct experiments or try new ideas? Q5. Are your leaders true innovators who take risks and support new ideas? These two questions alone on innovation culture are dead giveaways as to how innovative your organisation is. According to a survey by McKinsey, 94% of senior executives say that people and corporate culture are the most important drivers of innovation. A workplace that gives autonomy to both individuals and teams provides them with ownership of new ideas and empowers them to make decisions. Innovation is fundamentally about risk-taking and pushing past comfort zones. An environment where senior staff and executives micro-manage employees or provide too much red tape stifle creativity and hinder an innovative mindset. Leading the innovation charge in any organisation is no mean feat. Senior leaders as well as middle managers who encourage employees to generate and test new ideas are critical to fostering an innovative mindset. Leaders can further support innovation through removing roadblocks and red tape or providing access to resources for running experiments. Today’s most innovative organisations such as Apple, Tesla and Amazon have famous names at the helm, made notable by their leaders’ courage in risk taking, testing new concepts and departing from socially accepted norms. Leaders who take it upon themselves to be innovative, rather than delegating tasks, inspire their teams to be more creative and daring, resulting in greater chances of industry success. Q6. How easy is it for employees to access funding to try experiments? Resourcing innovation starts with a fundamental shift in mindset. An organisation that does not see value in innovation is unlikely to allocate precious funds, time and expertise to prototyping new ideas. This sounds obvious but it’s a vicious cycle that hinders progress, creates frustration and ultimately demotivates employees. Organisations that have well-funded innovation projects understand that placing numerous ‘small bets’ on various experiments are likely to unlock new innovations faster. This strategy stems from the startup world where funds are used not to create the end product, but are spent on systematically learning quickly and cheaply to validate or invalidate assumptions. This methodical way of learning rests at the heart of Lean Startup. While traditional companies focus on minimising financial risk by investing in safe projects or protecting themselves from reputational risk, their more innovative competitors are providing easy access to small amounts of funding to run multiple experiments. Q7. Are employees given time to partake in innovation activities (e.g. brainstorms, ideation, testing)? The lack of time is one of the most common barriers to innovation. Employees are too busy and consumed with their day-to-day duties to spend time testing new ideas or trying new things. Companies such as Google, Hewlett-Packard and 3M have shown that providing dedicated time for exploration can lead to significant innovations such as Google Earth, Gmail, Post-It notes and masking tape. Since 1948, 3M has allowed all of its employees (not just scientists and engineers) 15% of their time to pursue something they discovered through the usual course of work but didn’t have time to follow up on. This license to use their time to explore new ideas has led to countless innovations for 3M, which is repeatedly rated as one of the most innovative companies. Allocating time for employees to explore and pursue ideas is critical to enabling innovation and keeping employees engaged in the journey. Q8. Are employees provided training in innovative methods such as Lean Startup, Design Thinking, corporate innovation theories, etc? Thinking your organisation is innovative, or understanding the importance of innovation, is not the same as ‘being’ innovative. Although there is no cookie cutter solution for innovation capability to be adopted, there are numerous ways in which organisations can upskill their workforce, depending on the specific needs of the organisation. Building the right capability among employees to meet business needs and strategy is fundamental to achieving innovation success. Q9. Do employees have innovation as part of KPIs or development plans? Incorporating innovation into employee KPIs and development plans at all levels is a meaningful way to ensure that innovation takes place in the organisation. For maximum effectiveness, these KPIs should not have the same short-term timeframes of standard KPIs. Truly innovative organisations understand that the return on disruptive innovations is likely to take more than 12 months, which is the timeframe most organisations work on. Leaders in particular should have short-term and long-term strategic KPIs, to empower them to prioritise both incremental and disruptive innovations. To optimise innovation KPIs, employees should be crystal clear on how they can deliver innovation, whether that means attending a certain number of brainstorms or hackathons, undertaking a certain number of experiments or even measuring the number of learnings gained. Q10. Does your organisation have formal innovation roles and teams? Formal roles for innovation are an important symbol that the organisation is taking innovation seriously. However, these roles will appear insincere and part of ‘innovation theatre’ without providing autonomy, secured resources and the ability to take measured risks. Roles such as Heads of Innovation, innovation committees and teams that facilitate innovation represent important beacons in the organisation. Innovation requires some level of structure and process to manifest; providing clear job descriptions and measurable KPIs for specific innovation roles is paramount to ensuring innovation is more than a buzzword in your organisation. Would you like to know how you compare against other organisations in your industry? Would you like to know how to improve your innovation capability? 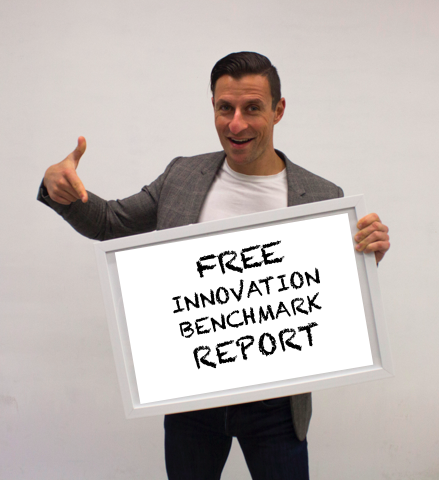 Get your FREE Innovation Benchmarking Report now.